Gear Technology's annual State of the Gear Industry survey polls gear manufacturers about the latest trends and opinions relating to the overall health of the gear industry. Gear Technology’s annual State-of- the-Gear-Industry survey polls gear manufacturers about the latest trends and opinions relating to the overall health of the gear industry. As in years past, the survey was conducted anonymously, with invitations sent by e-mail to gear manufacturing companies around the world. Results of research on trends in employment, outsourcing, machine tool investment and other gear industry business practices. Results from our annual survey of gear manufacturers reveal that business is good, but the skilled labor situation is not. Overall, the gear industry enjoyed a very strong 2018, and the optimism expressed by survey respondents is the highest in recent years. When asked about their optimism regarding their companies’ ability to compete over the next five years, 85.8% of respondents indicated some level of optimism. In October, Gear Technology conducted an anonymous survey of gear manufacturers. Invitations were sent by e-mail to thousands of individuals around the world. More than 300 individuals responded to the online survey, answering questions about their manufacturing operations and current challenges facing their businesses. Results of Gear Technology research on trends in employment, outsourcing, machine tool investment and other gear industry business practices. Gear Technology’s annual state-of-the-gear-industry survey polls gear manufacturers about the latest trends and opinions relating to the overall health of the gear industry. As in years past, the survey was conducted anonymously, with invitations sent by e-mail to gear manufacturing companies around the world. In November, Gear Technology conducted an anonymous survey of gear manufacturers. Invitations were sent by e-mail to thousands of individuals around the world. More than 300 individuals responded to the online survey, answering questions about their manufacturing operations and current challenges facing their businesses. For many of us, 2016 was a rough year - and the results of our annual State of the Gear Industry Survey show it. 40% of respondents indicated their companies had cut staff, while only 27% indicated an increase in employment. Clearly, there have been widespread cutbacks. The results of our Annual State of the Gear Industry Survey (See page 26) provided insight on 2016 as well as forecasts for 2017. Here is additional insight from some of the industry's leaders. We’ve just come off a very strong year for gear manufacturing, and most of you are looking forward to another good year in 2019. At least, that’s what the results of our annual State-of-the-Gear-Industry survey tell us. It's probably no surprise to anyone that the majority of the gear industry had a pretty good year in 2017, and that most gear manufacturers are expecting a pretty good 2018 as well. After all, most major economic indicators - including the ones that focus on the manufacturing sector - have been positive for some time. Never have so few served so many. That, in essence, describes gear makers and the role they play in our world. Think of it—although the gear cutting industry represents much less than one percent of the global workforce—the gears it produces are what make things run in practically every industry and profession imaginable. From bulldozers to Rolexes, gears are an integral part of the mix. Gear manufacturers are generally an optimistic bunch, as revealed by our 2013 State-of-the-Gear-Industry Survey, which appears in this issue. In October, Gear Technology conducted an anonymous survey of gear manufacturers. More than 300 answered questions about their manufacturing operations and current challenges. Last issue, when I went over the results from our annual State of the Gear Industry survey, I was being too nice. Sure, there's still a lot of optimism about the business climate. Gear manufacturers are mostly busy. For most, 2018 looks like it will be at least a little better than 2017. But there are dark clouds ahead, and they've been building for some time. For us, 2016 is the year of smart ideas. Not our smart ideas, but yours. We've spent a lot of effort collecting information from Gear Expo, our State of the Gear Industry annual survey and market research to find out more about what you want from us. We've also taken your suggestions and used them to make improvements, add new features and build on what we've been doing here for 32 years in our role as the Gear Industry's Information Source. Another year has passed and, because of the short term ups and downs of the economy, it's still hard to judge whether we are in an appreciably different place than we were a year ago. The economy doesn't seem to be worse than it was, but it also doesn't seem to be a whole lot better. Next year will be the 500th anniversary of Christopher Columbus' famous "discovery" of America. Poor Columbus has fallen on hard times of late, what with revisionist historians smacking their lips over his more notable failures and reminding us that American natives have a vastly different point of view on this Great American Success Story. But before we relegate the Great Navigator to the scrap heap of trashed-over heros, let's take one last look at some of the positive lessons to be learned from the Columbus experience - ones that could be instructive to our current situation in the American gear industry. Nashville - One of the highlights of this year's SME Advanced Gear Processing and Manufacturing Clinic was a tour of the new GM Saturn automobile manufacturing plant outside the city. There in the Tennessee hills is a hopeful vision of the future of the American automobile industry. It may well be the future of American large-scale manufacturing in general. The good news and the bad news about the gear industry and its role in the overall economy. Most of us would agree that the idea of a perfect world is absurd. Just for starters, who gets to decide what perfect means? "The Perfectionists" by Simon Winchester explores this theme as it relates to engineering. Publisher Michael Goldstein discusses why some gear manufacturing companies are enjoying record years. In May of this year the U.S. International Trade Commission made public its Report to the President on the condition of the U.S. gear industry. This 200+ page document is the result of a two-year study by the commission, with the help of the AGMA staff and members. 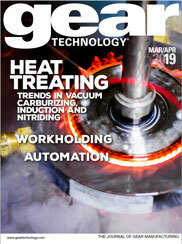 It is the most comprehensive and current analytical coverage of the industry conditions and tends presently available. Because of the importance of this report to the industry, GEAR TECHNOLOGY is devoting a good portion of this issue to reprinting the Executive Summary for our readers. Over the past several months, many gear manufacturers and industry suppliers have been telling me how busy they are. Their backlogs are the largest in history, their sales the highest they’ve been in many years. They’ve invested in new capabilities, new machinery and people. At the mid-year point of 2017, it appears that the U.S. economy, and the manufacturing sector in particular, are gradually accelerating, with most markets seeing an upside breakout from the flat or down conditions of 2015 and 2016. As the founder, president and co-host of Manufacturing Talk Radio, as well as publisher of Metals & Manufacturing Outlook eZine, I am excited to report that the economic outlook for 2018 is just too good not to tout. Whatever "final GDP number" the government divines for 2017, the year will finish above 3% for the first time in a decade. "If it ain't broke, don't fix it," goes the hoary bromide. But what if the time comes - and it most surely will - that in fact it is broke? Do you fix it or replace it? And when does gearbox maintenance and repair arrive at a point of diminishing returns and buying new is the answer? More than any other field, IIoT overlaps directly with metrology's mission to analyze and measure as much of the manufacturing process as possible, and it's no surprise that the latter is utilizing the former. This report describes Klingelnberg's vision of Industry 4.0 gear production. In March 1989, the U.S. Trade Representative requested the U.S. International Trade Commission to conduct an investigation and prepare a report on the competitive position of the U.S. gear industry in U.S. and global markets. Before we get into projections and prognostications about the future, let’s take a minute to review 2012. For many in the gear industry, the year was better than expected. Some manufacturers had a very successful year leading up to an even more successful manufacturing trade show (IMTS 2012). Others were searching for more business, hoping that the general state of the economy wouldn’t make things worse. In some cases, it did. The oil industry is (pardon the pun) tanking. That may conjure up horrific images of other industries following suit in a domino effect of collective collapse into the overabundant oil slick the industry is currently drowning in, but not everyone is getting knocked down alongside the oil sector. A very direct and effective way of increasing power transmission efficiency is a changeover from mineral-oil-based lubricants to synthetic lubricants. Most readers are at least familiar with continuous improvement programs such as lean and six sigma. Perhaps your shop or company is well along in the implementation of one or the other—if not both. But what about theory of constraints (TOC), introduced in Dr. Eliyahu Goldratt’s 1984 book, The Goal? Despite its rather negative-sounding name, this continuous improvement process has much to offer manufacturers of all stripes. And when combined with lean and six sigma, the results can be dramatic. Dr. Lisa Lang, a TOC consultant and speaker, explains why and how in the following Q&A session with Gear Technology. Circular arc helical gears have been proposed by Wildhaber and Novikov (Wildhaber-Novikov gears). These types of gears became very popular in the sixties, and many authors in Russia, Germany, Japan and the People's Republic of China made valuable contributions to this area. The history of their researches can be the subject of a special investigation, and the authors understand that their references cover only a very small part of the bibliography on this topic. Readers respond with their own crazy ideas about the mystery gear on the mountain featured in September/October 2008's Addendum column. The following article is concerned with the analysis of the wear-reducing effect of PVD-coatings in gearings. Standardized test methods are used, which under near-real conditions enable statements to be made about the different forms of damage and wear (micropitting, macropitting, scuffing). The popular perception today is that technological advancement is an engine running almost out of control. New products and processes are developing faster than we can keep up with them, as anyone who has had a new computer system crash into obsolescence practically before it's out of the box can tell you. But that's not the case everywhere. Transmission technology, for example. It is said that “The squeaky wheel gets the grease.” Ok, but what about gear noise? We talked to three experts with considerable knowledge and experience in this area. Joe Garfien came to America in 1928 to play soccer. He also learned to cut gears and build a business. "When I came here [to America] I came in on a Friday, and I had to go work on Monday, so I found a job at Perfection Gear...and that's how I got started in gears." In 1993, M & M Precision Systems was awarded a three-year, partial grant from the Advanced Technology Program of the Department of Commerce's National Institute of Standards and Technology (NIST). Working with Pennsylvania State University, M&M embarked on a technology development project to advance gear measurement capabilities to levels of accuracy never before achieved. The essence of designing gears is often by necessity risk-averse, given that many of them are used in applications where loss of life is a distinct possibility. The Gear Research Institute (GRI) at The Pennsylvania State University conducts risk reduction testing with the same goal in mind - whether it be gears in fighter jets, Ferris wheels, tanks, or countless other gear-reliant vehicles and machinery. Base oils play an important role in determining the performance of an industrial gear oil. They influence characteristics such as low temperature performance, biodegradability, energy efficiency and high temperature thermal and oxidative stability. Today gear drive operations have several options when selecting the proper lubricant for their gearboxes. As in the past, the primary lubricant used for gearbox lubrication is mineral oil. But with the advances in technology, synthetic hydrocarbons (PAOs) and polyglycols show very specific advantages in certain applications. With gear drives becoming more and more precise, it is now also to the benefit of the gear operator to verify that he or she has the proper additive package and viscosity in the lubricant selected. Fig. 1 shoes that a gear oil is a combination of a base oil and specific additives. The base oils can be either mineral oil, a synthetic or even in some cases a combination of the two. The complete Industry News section from the September / October 2014 issue of Gear Technology. Gear Technology speaks with David Goodfellow, president of American Pfauter, L.P., and Pfauter-Maag Cutting tools, L.P., to get his impressions about the state of the gear industry and its prospects for the future. Is economic relief on the way? This was the general consensus coming out of Indianapolis after Gear Expo 2009 closed its doors in September. Though the numbers were slightly down—2,539 exhibitors and attendees compared to 2,992 in 2007—it appeared to be steady as she goes at the gear industry’s biennial main event, good news considering the state of the gear industry since Gear Expo 2007 in Detroit.